Using an imaging technique that illuminates viral behavior within live cells, a team of scientists at the University of Wisconsin-Madison and the Morgridge Institute for Research are identifying new targets to derail the disease-spreading machinery of human immunodeficiency virus (HIV). The imaging tools, put to work in the virology labs of Nate Sherer and Paul Ahlquist, are providing a new understanding of the viral-host interactions of HIV infection. HIV is the virus that causes AIDS, a devastating disease that infects 35 million people globally, causing 1.5 million deaths annually and 6,000 new infections each day. HIV-host interactions are notoriously complex, but are key to its growth strategy. HIV has a miniscule nine genes and relies extensively on the host cell’s own mechanisms to continue to infect the body. Now live-cell imaging has opened a new window into the mystery. The scientific team is tagging specific viral proteins and genes with multi-colored fluorescence, then tracking their movement and behavior over time within the cell. “We are not just observing the viral behavior, but transitioning the images into quantitative data that will help us understand and exploit weaknesses in the viral system,” says Ginger Pocock, a postdoctoral researcher with the Morgridge Institute Virology Focus and with Sherer, professor of molecular virology and oncology. How HIV transports its genome, in the form of RNA, to different parts of the cell is at the heart of Pocock’s research. These color-coded movies of viral behavior are enabling the group to make side-by-side comparisons of infected human cells to cells from mice, which are immune to HIV infection. Pocock tracks a viral protein called Rev, which is required to transport viral RNA from the nucleus, where it is made, to the cytoplasm and cell membrane, where it buds off the cell in search of new cells to infect. The Rev protein continually cycles from the nucleus to the cytoplasm, unleashing thousands of generations of progeny to infect the body. The conventional wisdom had been that mouse cell immunity to HIV was due to the Rev protein’s inability to shuttle in and out of the nucleus. Pocock’s work showed that Rev moves in and out of the mouse cell nucleus without difficulty, implying that there must be a different reason for this failure to transport. 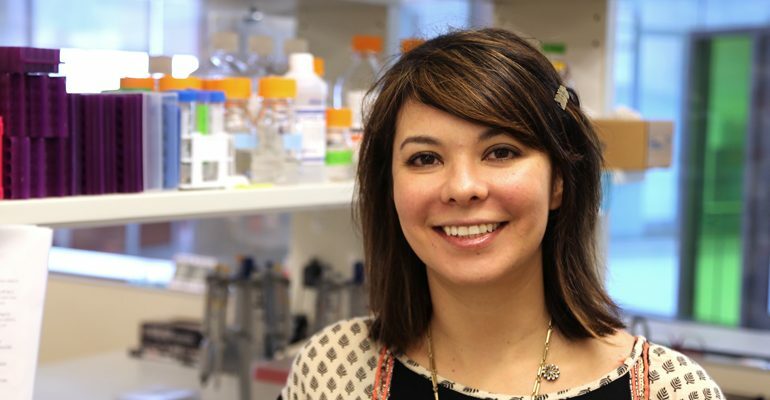 Pocock and her colleagues now are investigating a cellular receptor protein called CRM1 that needs to work in tandem with Rev for RNA transfer, and is somehow deficient in mouse cells. When Pocock’s group added human CRM1 to mouse cells, it restored the ability of those cells to transport genetic material. This “defect” in mouse CRM1 could have major implications for future HIV treatments. Finding new antiviral targets is essential to the continued fight against HIV, which currently has no cure and no vaccine. The current treatment for HIV is a sustained suppression of the virus through a multi-drug treatment. The “cocktail” of three or four different drugs attack different viral pathways — enough to keep the virus from mutating its way toward drug resistance. But this approach does not work in all patients, and no drugs currently attack the machinery within the infected cell that produces new infectious HIV particles. “Not only is it important to have more targets for HIV drugs, we would like to target these later steps in the virus life cycle, and essentially block the virus from spreading to new cells,” says Paul Ahlquist, director of Morgridge Virology and Pocock’s co-mentor. “Our next step is to determine the nature of that defect in mouse cells, and how we might use it to block the process in human cells,” adds Pocock. This work is made possible through a multifaceted campus partnership. In addition to advancement by Sherer’s group of live-cell imaging models to study HIV, Kevin Elicieri, director of the Laboratory for Optical and Computation Instrumentation (LOCI), and Ming Yuan, a professor of statistics and Morgridge investigator, developed new statistical analysis tools to quantify the imaging data in greater detail. How does our immune system recognize bad from good? Can all mosquitos transmit viruses like Zika?